A few weeks ago someone asked on my Facebook how I’d stack NEIPAs against commercial versions, I prefer my best to all comers, save Tree House Julius and Trillium Double-Dry-Hopped Fort Point. For my palate, across their lineup Trillium is close to perfect. The lack of a line to buy cans is a bonus. I also have a bias for the brewery that is open with their process, not to mention that JC is a former homebrew blogger and someone I've shared a few beers with. What is remarkable is that he has increased quality and scale, despite having to adjust process (including yeast). I’ve learned that putting my one-off attempts head-to-head with my favorite commercial examples of a style are often an exercise in humility. As a homebrewer I don’t have the reps to dial in a recipe the way a brewery does, I don’t have the equipment, or the resources. So, when I grabbed a four-pack of Trillium Stillings Street IPA (their Nelson Sauvin showcase) at the Boston brewery on my way to Logan last week, I was already looking for excuses for why the carbonating IPA I was returning home to wouldn’t be as good. This recipe is the culmination of three years of attempts at cloudy-juicy IPAs. Most of it will be familiar from previous batches, but as always a few tweaks. Water treatment was pretty much my standard, just a little more heavy handed up to 150 PPM for calcium, chloride, and sulfate. The grist was heavy on both flaked oats and Carafoam. I added a small dose of Columbus at 15 minutes to slightly elevate the bitterness over my NE Australian IPA, Columbus is rich in thiols which make it a good (inexpensive) choice for hot-side additions. Fermented with Omega British V, their answer to London III, harvested from my 2.3% NEIPA. A big dose of Mosaic and Citra pellets for a hop-stand, and another massive charge (8 oz in 5 gallons) 48 hours into fermentation once the yeast passed 50% apparent attenuation. When I was ready to keg I brought in a ringer, Yakima Chief Cryo Hops "LupuLN2" lupulin powder. I picked up samples at CBC, and ordered extra now that it is available to homebrewers. This is the alpha acids and oils roughly double-concentrated with much of the green plant material removed. The big advantage is that the plant material absorbs iso-alpha and other compounds from the wort (not to mention wort itself). While this may sound similar to T45 pellets, the improvement here is using nitrogen to reduce oxidation and temperature. The more concentrated the oils become, the more aromatic-volatilizing heat that is generated. See Scott’s fantastic post and Stan's summary for more details. Smell – Mix of big tropical fruit (mango especially), melon, pineapple, with that certain dank-fruitiness I get from Mosaic (even more from Nelson, and a bit less from Hallertau Blanc likely 3S4MP). While it has fruit flavor, it still has the telltale notes of hops. I enjoyed the aroma of the Mosaic Cryo, the Citra was so concentrated it was almost offensively dank, luckily upon dilution the contribution is delicious! The hop nose jumps out of the glass, even more so than the Stillings Street. Appearance – Glowing yellow body, a shade and a half lighter than the Stillings Street thanks to lots of oats and no C10. A couple flecks of particulate. Nice white head, great structure, but I wouldn’t mind if it lasted a little longer. Taste – Totally saturated juicy hops with just enough bitterness. Citra and Mosaic are punchy and can carry an IPA along, but together they have a wonderful synergy. Pineapple, orange, Sauvignion blanc, and mango. A little drier than Stillings Street, the sweetness enhances the “juice” character. Bitterness is perfect, just there without lingering. Mouthfeel – Smooth, coating hop oiliness, soft. Medium carbonation, or almost, perfect. Drinkability & Notes – A beer that is difficult not to have a second pour. Some IPAs grate on the palate, this one soothes the bitterness without being sugary. The combination of huge hop aroma, saturated hop flavor, restrained bitterness, and fluffy body is what I want to drink. Changes for Next Time – This is my dream IPA, the best NEIPA I have brewed. In comparison, the Trillium I bought four days before the tasting isn't as fresh and vibrant. Not their fault, how can you compete against beer that was in contact with dry hops 30 seconds ago? Might as well take advantage of every trick I have to make up for the lack for hop contracts, a centrifuge, and some of the best brewers in the country! Recipe was originally 11 gallons, split with a Hibiscus-Grapefruit IPA. Values represent the batch tasted here. 24 hours before pitching fed a cup of harvested slurry (~1 month old) from, 2.3% IPA ~2.5L of starter wort. Mashed in with 4.5 gallons filtered DC diluted with 3 gallons of distilled. pH of mash originally read 5.51 at Mash temperature (~5.7 at room temperature) with salts and phosphoric. Rest of phosphoric down to 5.36. Lactic (ran put of phosphoric) got down to 5.26/5.46. Sparged with 1.75 gallons of distilled, cold. Collected 7.00 gallons @ 1.053. Chilled to 75F left at 65F to cool for a few hours to 70F before pitching. Fermenting well after 12 hours. 67F internal. 6/20/17 Down to 1.026, dry hopped FV1 with 4 oz each of Citra/Mosaic. 6/28/17 Kegged with bagged hops, purged, in each (1 oz each Citra and Mosaic Lupulin Pellets from Farmhouse Brewing). NEIPAs are fantastically sensitive to oxygen, even compared to standard IPAs, here's what my gravity sample looked like after 24 hours exposed to the air compared to a fresh pour. The best guess at why this happens is the transformation of phenols into quinones via oxidation and perhaps polyphenol oxidase (a similar process is responsible for browning in avocados, tea, and cocoa). I suspect the color change looks more dramatic than clear IPAs given the low starting SRM and haze. Mike, what's your process for racking out of primary with so many loose hop pellets in there? It must be sludge at that point. So curious because this is something I struggle with all the time. Richard - I just tried Scott Janish's design of a dip tube filter he did with utahbiodiesel, works brilliantly! What temperature do you maintain for your whirlpool? The trick for racking, if you can call it that, is to start with extra wort so you can leave a gallon behind with all of the yeast and hops! I start with the auto-siphon in the middle of the fermentor and slowly lower it to keep it above the settled hops. First time using the lupulin, but it made sense to add as late as possible to me. It absorbs less, so better to add it to the already aromatic beer. It contains less green material, and thus less glycosides, so less chance of benefit during fermentation. I've never had issues with "grassy" flavors from keg hops, but again it could be beneficial to some palates for that reason. I don't do anything temperature-wise for the whirlpool, I add right at flame-out and it usually drops to around 190F by the time I turn on the chiller. Quick follow up re racking: to get the hops to drop, I'm assuming your crashing. But don't the hops go back into suspension once you take fermenter out of the fridge/freezer and you put it someplace higher than your keg? Sorry, just want visualize exactly how you're pulling this off. I always have a problem siphoning off pellet dry hops unless I bag them. Interesting to hear keg hops works with cryo? I had assumed the powder would get out of the bag. What bag? Just muslin? Just curious what you meant by "upon dilution" in the smell section of this post. "The There was so concentrated it was almost offensively dank, luckily upon dilution the contribution is delicious!" I'm just not sure if you diluted the whole batch or something. I'm 100% going to brew this as my first IPA! I don't cold crash before kegging, the hops drop out if given a week. I try to move the fermentor to a higher spot an hour or so before racking to give it time to settle if moving stirs them up. I use nylon knee highs weighted with marbles for keg hops. The fine mesh prevents hop matter from escaping, as long as you don't get a run. Dilution in the beer. I didn't enjoy sticking my nose into the package of Citra Cryo, but once that aroma was diluted into 5 gallons of beer it is pleasant. How long can you left the hops in the keg without getting grassy flavours? I'm not a quick drinker and gonna keg my first NEIPA tomorrow and don't know if I should put some hops into the keg. Hey Mike, great read and will give this recipe a shot as I just collected some cryo hops. Curious, are you doing a 60 min boil or less due to only late addition hops? I haven't had problems with a couple months. Even with good process your beer will be on the downslope by then. If you are worried, you could tie the hop bag off so that as you drink the beer they are suspended above the liquid level. Yep 60 minutes, the boil time is somewhat unintuitively listed at the top along with the various measurements of the beer. Looking to brew this recipe on Saturday, but had a quick question. I entered the info into Beersmith, but my IBUs came out lower than yours at 37 with all matching efficiencies. Is yours more reflective of the perceived bitterness due to the late hop additions? 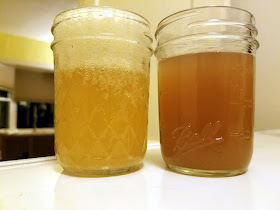 I've noticed that you and most of the other homebrewers always use kegs with NEIPA:s. Could you do a post where you bottle and bottle ferment one? 'Cause I don't have room for kegs and keezers. I've noticed that all my NEIPA:s are pretty darn good(fruity, citrus and smooth) before bottling and after a few weeks they start to taste like herbal liqueur with pine needles. So maybe Im doing something wrong (Yea no kegs, haha) or maybe the style just won't work in bottles. Johnny, NEIPAs unfortunately are prone to oxidation, because of the enormous quantity of late hops and oatmeal. The process of bottling imparts a lot of oxygen into the beer so they don't really recommend bottling in this case, though it can be successful with a very cautious process. Not sure why I'm getting more bitterness, they are entered at 30 minute "Steep/Whirlpool" rather than 0 min boil. If anything I adjusted the settings to reduce the bitterness from the whirlpool because I thought the default was more IBUs than I perceived from my setup (Steep/Whirlpool Util Factor is 35% down from the default 50%). I have 27 IBUs from the Columbus, the rest from the whirlpool. I'd suggest brewing to the strengths of your setup. Focus on other less-hoppy styles until you get kegs. Even with perfect oxygen exclusion (impossible), two weeks sitting warm to carbonate you're missing drinking good beer. Add to that lack of keg hops, aroma scalping by the crown liner etc. The best it would be would be a shadow of the kegged version. If you just have to give it a shot, get a CO2 tank to purge the bottles before filling. My bad. For some reason my steep whirlpool utilization factor was way low for some reason. Thanks for the help! For what it's worth, I've tried this approach of bottling a NEIPA while trying to minimize oxygen exposure. While I'm sure it won't be nearly as good as the same beer kegged, there are several things that I did that seemed to help minimize oxidation and preserve the hop character for about 4-6 weeks after bottling moreso than the typical bottling approach, where I had a similar beer turn out completely oxidized by the time it was carbonated. I don't have a co2 tank, so used a soda stream with sanitized tube attached to the end. Note that this is anecdotal and not scientifically rigorous in any way. 1. In place of kegged hops, I did a second dry hop addition as fermentation was slowing but not complete so the yeast would scrub the oxygen that gets in from opening the fermenter. I don't open the fermenter again until it's time to bottle. 2. Siphon quietly and purge bottling bucket before racking, and purge headspace several times during bottling. A better bottle with spigot would probably be better than a regular bottling bucket. 3. Purge each bottle before filling and then purge the head space immediately before capping (headspace purging makes a clear difference compared to skipping this step). 4. I only allowed 1 week for carbonating warm, then all the bottles went into the refrigerator. The beers were well enough carbonated for my taste. Thanks for chiming in Aaron, sounds like great advice! Hi Mike, unrelated to this post, but I clicked on the BYO link on your blog, and the link didn't work. Maybe needs to be updated somehow? Thanks for pointing that out, contacting BYO to see what the problem is. Feel free to click the link of Basic Brewing (http://www.basicbrewing.com/), or whoever you'd like to give a cut to! Question on the hop additions. Columbus at 15 minutes left until the boil and citra/ mosaic at flameout for 30 minutes? Hi Mike. Are you currently adding all your salt additions to the mash or saving any for the boil? I split 50/50 between mash and boil and occasionally get a slight aspirin flavour/finish to the beer...wondering if cutting back or eliminating the boil addition will solve this. I add them all to the mash because the calcium helps lower the mash pH (reducing the amount of acid required). In terms of finished flavor, the minerals will add the same thing if they are added to the mash, boil, or even the keg. I associate aspirin flavor with Amarillo hops, but certainly could be an overly mineral character. What is your target water profile? Yes, I left the Columbus in the screen when I added the flame-out addition of Mosaic and Citra. Curious if you could give a brief overview of your carbing process for these beers? I just started kegging and my first attempt was a bit to under. My second I over compensated and it's a bit more fizzy than I'd like. I just set the gas (~12 PSI) and adjust if needed. That's one of the great things about kegging, you can always increase or decrease the pressure to get the results you want! I did for this batch, but I've also tried spunding with good results. I know you've bottle-hopped some of your beers in the past - do you think using the cryohop powder in-bottle would be a viable technique? While it would mostly settle to the bottom, I imagine that for those of us bottle conditioning - or for competition! - it might be an interesting way to get some fresher aromatics a la keg-hopping. Cryo in the bottle is a bad idea. It doesn't settle well, would cause the beer to gush, and could lead to throat irritation. When I've done bottle hopping it has bee with whole hops, and I'm prepared with a strained and a big glass when I pour. Even that would be risky for a competition unless you aimed for "cask" level carbonation. I remember brewing your "Hop Juice" in 2015 and really loving it, but this one looks incredibly more tasty! This is clearly my next brew. On the other hand, it seems quite difficult to find Cryo hops in Canada at this time. Do you think I'll still get close to your final result using pellet hops for dry hopping in my keg? Thanks! I just got an ounce each of Citra and Mosaic lupuln2. I am going to brew a similar IPA tomorrow. What was your process keg hopping with cryo? I am wondering how much contact time at room temp the lupuln2 powder needs to reach full absorption. Any advice? You can certainly use pellets (roughly double the cryo addition) and the beer will be excellent! When I keg hop I'm moving the keg directly into the kegerator and allow it to chill once it is filled. So the beer will still be warm for awhile. Cryo extracts within a few hours from what I've read. Could I drop the Cryo hops into my fermenter maybe for a day then cold crash and transfer to a purged keg? This sounds absolutely delicious and it is definitely on my list to brew. I just need some clarification, you put the cryo hops in the keg after racking to it, and pressurize it for carbing. Then you leave the cryo hops in a weighted bag in the bottom until the keg is all out? If so, have you had any problems with throat irritation? Did you find the 150ppm was key in producing a soft and juicy IPA? I've read so many articles pointing to high ratios of sulfate to chloride, visa versa or all high. I'm brewing one tomorrow and would love your thoughts since it seems you've recently done all three! Do you think water profile is a major contributing factor in producing a juicy quality? Or do you think that's more of a variable with the hops, yeast, ph, temp and timing? And if so, do you recommend your latest levels? I don't think that water salts need to be exactly anything, but the general range is 100-200 PPM for both chloride and sulfate. I aim for more minerals (both) in lower gravity beers to compensate for less minerals from the malt. Otherwise it is to taste, 150/150 was about right for me in an APA/IPA. Chloride is part of the signature character of NEIPA compared to other IPAs, but it is more mouthfeel than juiciness (although that softness helps the juiciness of the hop and yeast esters along). Thanks for the quick reply! And I tend to agree. The reason I had confusion, was because I've seen several people point to higher sulfate producing less bitterness, and therefore, more of a soft juicy flavor. For example, your "Hop Juice IPA" recipe where you used higher 2:1 sulfates:chloride, http://www.themadfermentationist.com/2015/06/hop-juice-north-east-ipa-recipe.html But then I saw BYO posted about the Julius clone having an opposite 2:1 chloride:sulfate, which made me reconsider. https://s-media-cache-ak0.pinimg.com/originals/86/9c/5c/869c5ca0ff68adb5982b9fe466cb11f0.png So I was pleased to see you had your best results yet, with an even dispersion. I'm starting to think it's more about the yeast, ph, temps, late hops and timing. For example, since I drink a lot of the Aslin beers here in VA, I've perceived a ton of their "juiciness" may be coming from high amounts of yeast lingering and late lupulin additions. So as they preach, "drink fresh ya dingus"! I have a batch going on tomorrow, and will do 150's across the board with london 3, 15 min warrior boil, Citra, Mosaic, galaxy out/whirlpool and the same for the 1st dry, then citra and mosaic cryo for the 2nd dry in serving. I'll be sure to report back on how it turns out. And thanks again for all of the amazing write ups, can't tell you how awesome it is to be able to read through your experiences. It motivates me on wanting to try new ingredients and experiment with new brewing methods! Where did you get that my recipe was 2:1? As it says down in the notes, 120 PPM chloride and 140 PPM sulfate. That Julius clone is likely just a guess, Tree House is very private about their process. My upcoming BYO article has a mineral analysis of finished Alter Ego, the grain obscures the original water profile, but it is clearly high in chloride. Cheers, and best of luck! You mentioned your ideal water in the link I added above, about 1/2 way down in the comments. Says 2:1 sulfate. And I've read elsewhere as well. Read that people feel the higher sulfate increases mouthfeel and lower chloride lessens bitterness. I tried 150 across as you did though, so we shall see! And thanks, I'll circle back once it's done! All looks great so far! I'm still not seeing where I said 2:1 sulfate. I see "150-175 PPM sulfate, 100-125 PPM chloride" as a range I suggested at one point. Is that what you're talking about? I've never heard that sulfate enhances mouthfeel, chloride is the one that usually comes back as mouthfeel-positive in studies. If anything sulfate increases the perception of bitterness and crispness in the finish. Love this post. Still trying to nail my IPA recipe. Was there any particular reason you chose to use whole Columbus rather than pellets in the 15-min addition? I've been having mixed results trying to nail down the NE IPA style. I find that the biggest issue is a harsh astringency in the finished beer along with a vegetal hop flavor/aroma as opposed to the fruity/juicy aroma I'm after. The frustrating part is when I transfer the beer I'm getting delicious and beautiful aromas in the spent hops going down the drain but it's not coming through in the final product. I've noticed it most using WY1318 and I have a feeling it's linked to polyphenols in the final product that is a result of heavy dry hopping along with a low floccing yeast and high protein wort. I'm monitoring pH at all steps of process and am right on and don't oversparge so I can rule those out. Curious if you have any hunches on this issue and if the use of cryo powder/pellets is one potential solution (in order to minimize vegetative matter). Happy to give more details if you'd like. Thanks! I've done about six NEIPAs this point. My process sounds very similar to yours, and I also ferment in corny kegs and minimize o2 exposure to everything. I've had this exact issue you describe in all of my batches, a few worse than others. Have you figured anything out? Feel free to post/email me with your whole process and recipe. You could certainly try PVPP to see if that will help to remove some harshness. Cryo could certainly help. I'm about to add my DH and had a question about ferm temps. It seems you started in around 67 degrees, but did you slowly rise it towards the end? And if so, what was the warmest you did and for how long? I've read warmer temps w/ British yeasts produce a really juicy quality, which I too am after. So I was curious how warm you recommended I should go and for how long? I try to keep fermentation under 70F, always best to finish at the high end of the range to ensure clean-up. Once fermentation is complete there isn't a benefit to continued heat. Mike, I have been hard at work trying to nail down my NEIPA. First started with a Sips of Sunshine recipe put out by Sean Lawson and while it was great I felt like it needed much more mouthfeel. I have since started experimenting with my malt profiles. I used the same malt profile as JC but still didn't get the smooth creamy mouthfeel I was hoping for, using a chloride of 150 ppm a sulfate of 75 ppm and calcium 125 ppm. I think i just need to really up the oat profile. What I don't understand is why use carafoam/carapils in the malt profile. I was under the understanding that oats help with mouthfeel and head retention. Seems like using carafoam/carepils is pointless. For my next batch I am going to try 14% flaked oats and 14% malted oats similar to what Ed does over at Ales of the Riverwards for his pursuit of Tired Hands clones. Thoughts? Second comment/question. I have really been able to get a big aroma that I like but when I taste I am missing the juicy profile I get when tasting commercial examples. I get more bitterness than I want and it's a bit harsh. The beer really tastes best almost 2 weeks after kegging. I am thinking the yeast needs to drop out or everything needs to come together in the beer. Do you find this? I think for my system I was getting more bitterness than I want from my whirlpool addition. Initially I would chill to get the temp down to about 180 then hold that temp and whirlpool with a pump for 30 minutes. I am thinking 30 minutes is to long so for my next batch only going to try 20 minutes. I am also going to just put all my hops in at the whirlpool (8 oz citra) and nothing in the boil. Because I am not going to do any hops in the boil, I was going to try a 45 minute boil just as an experiment. I can't believe 60 minutes is needed for these late hop addition NEIPA's. Sorry for the long post!! Sounds like a good plan! I haven't gone back to malted oats since a batch of NEIPA that didn't turn out well for other reasons. I usually don't start drinking mine until about a week, waiting for carbonation. Certainly takes a couple days of pouring glasses with some hop particulate for it to smooth out. For me all whirlpool, even right at flame-out, isn't enough bitterness for my tastes. That's the thing about homebrewing though, dial in for your system and tastes! - what is the ideal carb level for a Neipa? I've never had one so would you say that it is similar to IPA or closer to Hefeweizen? - Do you add wirlfloc and yeast nutrient toward the end of the boil? - Since I live in Europe, and we dont have cryo - I bought regular hops x 2 where cryo is indicated. - Do I add the first dry hop at day 2 of fermentation and just leave the bag in there for the duration of the fermentation? - How long does fermentation last? Two weeks? - Is the fermentation temp is 67. NEIPAs tend to be carbed a little lower than a standard West Coast IPA. Maybe 2.1-2.3 volume. That helps to enhance the smoothness of the body. I go back and forth on whirlfloc and yeast nutrient. When I add it to a recipe, it will be listed. Totally fine, this way my first batch with Cryo. Just kegged a new batch without it last night. Yes, you can either target time, appearance, or gravity as indicators of when to dry hop. I leave them in until kegging. Fermentation should be done well before then. I usually package around day 10, to give some time for the dry hops to settle out. 67 was the internal/wort temperature during the peak of fermentation. Quick question. Are the cryo hops treated the same as pellets where you just put them in a muslin bag into the keg? Yes, they don't settle well. I'd consider bagging them even in primary. I'm a frequent reader of your blog and really enjoy reading it! I also bought your book and hope to take the plunge into sour beer when I get the space to do it. I have with great interest followed your steps in to the world of NEIPAs (and other hoppy beers for that matter). Due to being located in Europe, I have never tried any of the celebrated examples of the style and thus have no clue how it should actually taste. However, based on the typical description of the style, it is exactly what I want to brew! So far I made two attempts that I bottled. These came out tasting flat (basically only bitter, no juicy/tropical fruit flavor) while the aroma faded over a short time. I then took the plunge and invested into a keg-system. The keg was inaugurated by brewing the recipe of this post (differences: scaled to 2.5gal, fermented with wyeast 1318 and non-cryo keg hops (2x the recipe amount)). The beer was brewed on a grainfather. The boil and whirlpool hops were added in a hop spider. The beer was fermented at 19-20c (66-68f). The dry hops was added lose in the fermenter according to the recipe. FG 1.014. The beer was transferred into a purged keg using a siphon and CO2 pushing the beer out of the fermenter. The keg hops were lose in the keg with a keg filter similar to Scott Janish approach. Result: The aroma is much better compared to previous attempts with a mix of tropical fruits, but I would not describe it as jumping out of the glass. The flavor is again flat and I can't really pick out any tropical fruit/juiciness. It is just mostly bitter and does not at all taste what the aroma promise. Obviously, our equipment is different and I'm guessing that I have to adjust my approach somewhat to gain the missing flavor. Do you have any suggestions on what changes might help? Should I, for instance, decrease the temperature and the time for the whirlpool? Greetings from a disgruntled reader from Sweden. I assume the hops smelled good before adding them? Hops quality is always an issue, especially with international shipping. I assume by purged you mean more than a single pressurize and release? Each purge knocks about half of the oxygen out of the keg (because atmospheric pressure is ~14 PSI). You can certainly scale back the bitterness by lowering the whirlpool temperature or dropping the 15 minute addition. Like salt it is a too-taste situation. Scott often finds my beers a bit more assertive (in terms of bitterness and dry hop rawness) than his. We'll be doing a bit of both at Sapwood. You may also just need to wait a week or two, often people comment that the flavor comes around to juiciness in a week or two. I suspect that is just the hop particulate and iso-alpha-coated yeast dropping out of solution. Lastly, tasting the beers... as Americans have long done to try fresh European styles, you may have to plan a trip to New England! Yes, the hops were smelling good, at least based on my experience. The local store I'm buying from have the hops (from 2016) in vacuum sealed (or co2-filled) bags stored in a fridge. However, I have no clue what happened to them before they got there! I pressurized the keg to 2 bar (~30psi) and released three times. Then I added keg hops and filled the keg with the lid off (since I have lose hops and a keg filter around the dip tube). I have been thinking about some kind of closed transfer but it is difficult due to the filter around the dip tube, maybe by filling through the gas port? Definitely, and I think it is great that everyone has a different taste, otherwise I guess we would all be drinking THE one and only beer :) It's not really that I found it too bitter, it is just that I could not really get any tropical fruit in the flavor! I've been trying to read up on the effects of time and temperature on the whirlpool addition. The information is really varying. There seems to be consensus that whirlpool at flameout will add bitterness, flavor and aroma. Furthermore, that lowering the temperature before adding the hops will lower the bittering potential. However, I haven't really found any information about any potential differences between flavor and aroma. Do you have any insight? Will there be a difference in flavor? What can be done to increase flavor? Actually, my previous post was soon after kegging, now after a few more days in the keg it has definitely gotten better (the aroma is more potent and there is some tropical flavor). I keep reading that NEIPAs should be consumed as fresh as possible, but how soon is fresh? :) I've always thought that dry hopping will add primarily to the aroma, but could it be that it actually also add to the flavor in this type of beer? That all sounds good. I doubt it is the cause, but I like to put the hops in and then purge to ensure that most of the oxygen around them is flushed out. Closed transfers are nice, but I've never had an issue with a similar process to what you describe. Bitterness is a relatively easier answer because we are primarily concerned with a single compound, alpha acids. Their utilization rate falls off precipitously with temperature, so lower temperature whirlpool means lower bitterness. For flavor and aroma where we are talking about dozens of compounds, the answer is not so simple. I find that the off-boil steep maximizes what I think of as kettle-hop character, that backbone of saturated hop oiliness that beers only dry hopped are missing. I'm sure anything above 90C will give you much of the same effect. You could also try staggering the additions, half the addition at flame-out, half after 15-20 minutes. I used to do frequently, but got away from it when I started lowering the initial bittering charge. Aromatics certainly add to flavor, just not the same as a late-boil addition. NEIPA is about freshness, but many people (me included) like them best starting 10-14 days after kegging allowing time for carbonation, and "clarification" (or at least sedimentation). You could consider adding gelatin to speed this up, but I'm alright waiting a week or two! We'll certainly be spilling some of our secrets, but I think there is something to be said for not spelling out every single detail. Allowing other brewers to make their own leap at the last step to ensure we aren't all brewing the same beers! Modern Times is killing the hazy IPAs, with only a little nudge from me in the right direction to start. I am looking to brew this one soon. Do you think it could scale back to a session IPA successfully? You can scale it, but you may want to tweak it rather than just cutting everything by 40%. Here's a recipe I did for a 2.3% NEIPA. A few thoughts, increase the mash temperature, swap in some more characterful base malt, up the chloride, and focus on cutting IBUs rather than hop aroma. Best of luck! This looks great. I'm going to brew it this weekend. One question: It says you mashed with 4.5 gallons diluted with 3 gallons distilled) and sparged with 1.75 gallons to collect a total of 7 gallons. Does this mean you mashed with a total of 7.5 gallons? Isn't that a super thin mash? Or does this mean that the 4.5 gallons vow god mash included 3 gallons of distilled? But if that was the case, I'm not sure how you would collect 7 gallons with 4.5 + 1.75. Correct 7.5 gallons in the mash, I do a really thin mash with just a little sparge water. You should adjust the volumes to suit your system, it wasn't something special for this batch. Here's a write-up of my process. Good luck! Do you add pure O2 to NEIPAs? I know oxygen aids the fermentation process but can oxidize hop flavors and aromas. Depends, usually I just shake. Oxidation isn't a major concern pre-fermentation if you are pitching healthy yeast. I was wondering what you're trying to accomplish with all the carafoam. All the research that I've read seems to suggest that in the presence of enzymatic malt, all the long-chain sugars in carapils/carafoam are broken down anyways. Am I missing something? Correct, however not all dextrin malt is the same stuff. Weyermann Carafoam is more like chit malt, undermodified with lots of protein. I'd bought a bunch for a 2.3% session NEIPA and had some leftover to use up. Seemed worth trying. Hi Mike, super great site and thanks for all the responses. I'm deadset on trying this recipe this weekend using a non-keg, no CO2 setup. From what I've read on your site, and the research links you have provided, NEIPAs are very sensitive to oxidation due to the oats in the recipe. I'm going to cutout the oats with the hope that I can maximize flavor/smell by sacrificing color/haze/mouthfeel. Hi Mike, i added keg hops times 2 because there's no Cryo where I live. Should I leave the hops in the keg for two weeks? Or should I bottle after carbonation and let the beer age for 2 weeks? Troy, I haven't brewed a bottle-conditioned NEIPA, and I'm not likely to try. I had a hard time brewing competent West Coast IPAs before I started kegging! I'm an advocate of brewing to your limitations. No temperature control in the summer, brew a saison! In this case I'd suggest a less-oxygen sensitive style. Oats certainly don't help stability, but the big issue is the hops and their delicate aromatics. I'd leave the beer in the keg until it kicks. I don't transfer off the keg hops, never had an issue with grassiness. Bottling from the keg only risks oxidation. Carbonate it and drink it as the hops soft and the juiciness comes out! 1) Word on the street says that first wort hopping can help offset the harsher bittering flavor profiles - since a sweeter, less harsh bitterness is desired in the NEIPA style, and myrcene oil is volatile and vaporizes easily, does it make sense to try to FWH a very small amount (0.25 of each) as a bittering addition? With mash temp at 154F I'm right in the right hop extraction temperature, but I fear I'll lose most of the value I'll get in the boil anyway. 2) Similar to the first question, for whirlpool timing wouldn't it make sense to drop the temps down to the 155-160F range and extend whirlpool time to extract the most hop oils possible? I love the style and the information you and Scott Janish have dedicated to this style has been super instrumental in helping me understand and craft this style. Thank you! 1) I've really never bought into FWH. Most blind studies on it fail to find a significant difference in measured IBUs or bitterness perception between it and a early-boil bitterning addition. The few studies that have been significant have been on subtle European styles. 2) I think of whirlpool temperature as being primarily about bitterness. If you are looking for a low bitterness beer, then it is a useful technique. I find that even with a 212F starting temperature I need the small dose of hops at 15 min to get enough bitterness for my palate. I think it is counterproductive to lower the whirlpool temperature only to add more boil hops. You'll be getting those easily-volatilzed oils from the dry hopping, so I don't worry about losing them for the whirlpool hops. Cheers! Best of luck! There isn't perfect consensus on the style, even Scott and I aren't aiming for exactly the same flavors from our beers. Thanks for the reply - I am humbled. I’ve tried two NEIPA recipes and both had stuck sparges despite my rice hulls. I had to resort to ghetto sparging, aka bailing the water out of the mashtun and draining it over a large strainer. How does your setup mitigate stuck sparges with such a protein rich grain bill? Thanks for sharing so much about your process, Mike! I’ve learned so most of what I know about brewing from your blog. With this recipe, did you have any issue with using the old-fashioned rolled oats instead of flaked oats? I know they’re similar in a lot of ways, but I’ve read about people having conversion and/or stuck sparse issues with some rolled oats if they don’t do a cereal mash first. I've used a lot of different types of oats and haven't had conversion issues with any of them (judging from consistent efficiency). Certainly safer to use quick or instant oats (similar to flaked) if you are worried about gelatinization. I don't think a cereal mash would impact the flow of wort, rice hulls are a good safety to prevent that. I find the speed of the run-off to be the most important factor. I've gotten a feel for the grainbed. If it begins to solidify, I slow down. You might also consider your crush, maybe too fine? Awesome thread and follow-up. Thank you Mike. A few questions on your kegging step. It sounds like you did not use a closed pressure transfer, is that correct? So, a regular siphon transfer? When you mention "purging the keg" Can you walk through this and your kegging steps a bit more specifically? My process, which may very well be flawed is: I usually fill keg with starsan about 3/4 full, bring it to my keggerator, pressurize a bit, run it through my keg line, then release the pressure, open the lid, dump out remaining starsan, drop in the siphon and gently let the beer flow into empty keg. When done, close lid, hit it with 30PSI, burp it after about 6-12hrs for any oxygen, and let it go about another 36hrs, so a total of 48hrs at 30PSI while standing up, then turn down pressure, burp and serve until keg is done. Preferred carbonation level notwithstanding, curious to hear your process. You mention Trillium had to switch yeast. I had read they used WL 007, what did they switch to? Correct, regular auto-siphon transfer. Never had an issue as long as the keg is flushed and I'm careful with the transfer. Working on a closed transfer, just out of the knowledge that I can always improve my process! To purge I pressurize to 15-20 PSI and release four times after placing the dry hops in the keg. You could fill the keg to the brim with sanitizer and push it all out, but I'd rather waste a little CO2 than have the hassle of that method. Your method seems like it would allow oxygen back in after partially purging. No reason to wait to burp the keg, I do it 4-5 times immediately after filling. I clean/rinse/sanitize the keg and the lines separately using a Mark's Keg Washer. Not sure what Trillium uses now. The change was more process/scale related from what I understand. Ive been debating on how much to worry about keg hops and O2 on NEIPAs. Ive got a spunding setup and can do completely closed transfers. Been thinking about if it's more beneficial to do keg hops vs completely filling and draining (so no O2 at all) a keg then closed transfering. I'm leaning towards keg hops because duh, more hops is always the answer. That's my feeling as well. Hops in, purge, and then fill. I find they extend the drinkability of the beer, and I haven't had issues with oxidation in the 4-6 weeks it usually takes a keg to kick. Please give some clarification on the keg purge steps. I get that you place the dry hops in a bag in the keg, then hook up a CO2 line, pressurize the keg to about 20 PSI, and then release (pull the relief valve ring) four times. Then what? Unhook the CO2 line, release all the CO2 in the keg, take the lid off the keg, and then fill from the fermenter? Exactly, fill the keg however you usually would. I had been doing what you describe (open the keg's lid and siphon in), but have started playing with connecting the spigot on the fermentor to the out-post and allowing the beer to flow in. Seems like I need a little in-line filter to make that work reliably though. I've been (attempting) to fill kegs similarly through the liquid out post (though I'm using a siphon, so that may defeat the purpose) and have had issues with hop pellets clogging the line. Do you know of an in-line filter that would work for this to prevent clogs? Thanks! I had several people on Facebook and Twitter suggest this "Bouncer" inline filter. Haven't used it myself though. Do you think an American ale yeast like 1056 work on this recipe? It would work, but it would create a rather different more West-Coast IPA. How do you think this will effect the haziness? I'd assume it won't be as cloudy, but I'm not sure. I'd suggest brewing for the flavor/aroma/mouthfeel you want and not worrying about clarity! Man, what a good write up. I got a wort share from a local brewery, and "adapted" your recipe to create a NEDIPA from their wort. My brew process completely screwed up, but thats beside the point. What about lactose? I have brewed a couple of NE brews and all have had lactose. My last NEIPA I had a MASSIVE amount of lost volume to trub... what are your comments there? Do you add hops in a bag or screen canister? For the recipe I adapted off of this I added the 1.25 Columbus right to the kettle, but the Citra and Mosiac step/whirlpool hops I bagged and removed t the end to cut down on lost volume. Lactose is certainly an option if you like them on the fuller/sweeter side. It is easy to dose in post-fermentation to taste. Sapwood Cellars will be a vegan brewery, so I've been avoiding lactose for the last year or so. Certainly the high-protein adjuncts and malts can add to the amount of trub. I have started using 400 micron screens both in the kettle and the keg to contain the hops. I was going to give this recipe a try. I have not worked with water chemistry before. Playing with an online calculator I noted the Gypsum and Calcium Chloride additions only modify Calcium, Sulfate, and Chloride content. You've noted Magnesium, Sodium, and Bicarbonate levels as well in your table. Are these coming directly from your water? I'm planning a no sparge BIAB with distilled water so assuming all three are at or near 0 ppm. Would you worry about this? Correct, those amounts are assumed based on the annual average for my local water. I wouldn't add any of them to distilled water. One of the issues with cryo is that the high oil content makes it difficult to disperse and drop out of the beer. You can certainly try it, but you may still want to bag/weight it. Hello there ! I would like to know if your using hops spider at flame out? Yes, I'm using the hop spider pictured for all hop additions. You likely have lupulin still in suspension. While freshness is key for the style, it also benefits from a week or two cold before serving. The one big drawback of Cryo is that it doesn't settle out as quickly as classic T90 pellets. Thanks Mike, I did neglect to mention that it was kegged less than a week ago. First time using Cryo, will bear that in mind for the future! I do wonder if gelatin would assist in accelerating this process. I wasn't going to use gelatin given that it's a NEIPA however I may try. Thanks again and hope all goes well with the opening of Sapwood Cellars. Your recipes are a huge help for formulating IPA recipes. Like yours, I usually bitter with a 15 min addition of 1.25oz Columbus. This may have been asked before but I was just wondering If you usually do a full 60 minute boil or if you've ever tried just a 30 minutes with this hop schedule? I do usually go for a 60 minute boil, but I have done 30 on a few occasions with good results. Shouldn't be an issue on a homebrew scale with pale malt. I might start getting nervous with Pils and/or a commercial system. With a quick-chill DMS wouldn't be a concern, but with a whirlpool you'll still be generating it as the beer sits. Thanks for your recipe, I made it a few months back as closely as I could manage and it turned out great. I'm planning on brewing a variation on it this weekend - the same but with different hops. I have 100g (~3.5oz) bags of Citra, Simcoe, Mosaic and Nelson for it. I was planning on using all of them but do you think there's a better ratio to use? I don't have much experience with Nelson so I'm not sure how powerful it is! Citra-Simcoe-Mosaic is a favorite combo of mine. Nelson certainly won't overpower it, but you are approaching the point where you start losing complexity as the hops cancel out their varietal character. I'd suggest using one or two of them hot-side and the rest (Citra-Nelson?) for dry hopping. That'll give a clearer hop character, and showcase the Nelson so you get a better sense of its potency. I haven't, but I have played with keg conditioning with CBC-1 and a small amount of sugar, as well as spunding the keg to allow the yeast to scavenge oxygen. That said, what you are describing doesn't sound like krausening which is performed with a small amount of younger beer (so it has more active yeast and sugars). Just out of curiosity, why do you use so much Carafoam? Ive never played around with it much. Carafoam is essentially an under-modified malt, meaning it has more medium-length proteins. These should be good for motuhfeel and body, and could have interesting interactions with some compounds in the hops. In general though, I'm fond of "pushing" recipe design to see what happens. Going outside the traditional range just to see what happens. Actually transfering a 20 bbl batch of a recipe along these lines today at Sapwood. We're using Best Chit Malt instead of CaraFoam (a pretty similar under-modified German malt), but the rest is nearly identical. It'll be called Cryovolcano!